Are you a pro athlete in a fitness based competition sports like Aerobics? Then the happy gold program is for you. Paulo Santos has more than 20 years of experience in coaching pro athletes and teaching them everything they need to reach their dream goal of becoming a champion! More than 80 gold medals won by athletes that have been coached by Paulo Santos in the last 20 years speak for themselves! Now it is time for YOU to believe in the program and work hard for the Gold feeling of Success. Visit the special Happy Gold Homepage to purchase Happy Gold. Since over 20 years, Paulo dos Santos has been working together with pro athletes all over the world. Read more about what Gold medal winners have to say about the work with Paulo and being part of the Happy Gold program. I am an professional aerobic gymnastics athlete. Since four years I am working with Paulo dos Santos and I can really say that my results became better and better. I start to win very big competitions (Bronze Medal – World Championship 2012 in Sofia; Gold Medal – World Cup 2012 in Kufstein; Gold Medal – World Cup 2013 in Tokyo; Gold Medal world cup Portugal 2014; Gold Medal – World Championship 2014). My name is Angela McMillan. I am the Head Coach of the Hanoi Aerobic Gymnastics Team and have been for the past 3 years. I have been working alongside Paulo Santos as an athlete for over 10 years and Paulo played a major role in me becoming 2004 World Aerobic Gymnastic Champion. Since then I have supported the Happy Dance Power System that Paulo has created. I believe it is a great programme that has the ability to change lives, body and souls from young to old. 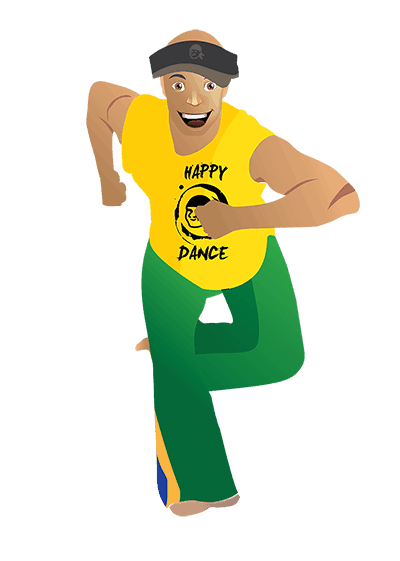 Unlike any other programme Happy Dance is fun, educational that uses music, movement and mental exercises to help develop not only movement and coordination, but selfesteem and happiness which is the most important aspect of a childs life as they move through adolescent through to adulthood. Here in Hanoi we are implementing the Happy Dance philosophy and techniques and seeing great results with children ages 6‐20. Especially in confidence and the ability to strive for more of what they want and deserve in their life. Happy Dance is a unique and amazing programme that I support it and highly recommend as a crucial part of any child’s life.